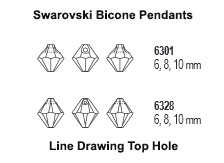 Swarovski Elements 6301 and 6328 Bicone Pendants make great accessories to our Murano glass beads. Use these faceted bicone pendants as small drops with some of our sterling or gold filled chain, or as a dangle from a Murano glass pendant or earring. With the top hole, its easy to attach them with just a jump ring. See the line drawing.